Reimagining your business involves looking at it as if you’ve never seen it before, and thinking about how to deliver value to your customers in a completely different way. 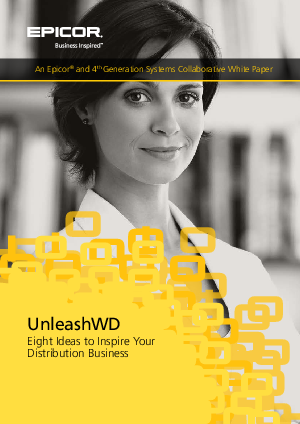 Read our whitepaper, where we have identified eight ideas based on excerpts from the inaugural UnleashWD Innovation Summit, produced by 4th Generation Systems and co-sponsored by Epicor Software Corporation. The summit brought innovators from outside the distribution industry to the TED Conference-inspired stage to help distributors rethink their business and catalyze a new wave of innovation and business model transformation throughout wholesale distribution.